DUBAI In less than a year after recognising Israeli regime’s sovereignty over occupied East Jerusalem, US President Donald Trump, in the presence of the Prime Minister Benjamin Netanyahu, signed a declaration recognising Israeli sovereignty over the occupied Golan Heights at the White House on Monday. Analysts believe that the controversial American move came as a result of several factors involving Israel and the region, including the Israeli elections on April 9 and the actions of the Syrian regime that led to various foreign states, and non-state actors gaining a foothold in parts of Syria. Add to this the weakness of the Arab world, he said. “There are two main factors: the Israeli desire to utilise the presence of President Trump in the White House to the hilt, and an Israeli desire to take advantage of the current level of conflict going on in Syria,” said Mohammad Juma from the Cairo-based Al Ahram Centre for Political and Strategic Studies (ACPSS). The regime in Tel Aviv has sought for a long time to claim sovereignty over the strategic plateau it captured during the 1967 Arab-Israeli war and annexed in 1981, officially making it a part of Israel, Juma told Gulf News. “As the war raged on in Syria, Israel used the pretext of Iran’s support for Bashar Al Assad’s regime to achieve its aim, and to employ the support of the current US administration to implement its expansionist agenda in the region,” Juma said. The Israeli plans and the American support for Tel Aviv, coupled with the absence of a unified Arab position on different issues, all offered a conducive atmosphere for Israel to push forward its plans, said Arab analysts. However, some analysts attributed the US decision to the Al Assad regime. As for the Arab region, it hasn’t recovered its equilibrium since the invasion of Baghdad in 2003, he said. Since its capture more than 52 years ago, the Golan Heights didn’t witness any escalation between the Syrians and Israelis, analysts said. Meanwhile, Damascus, according to them, is left with very limited options especially given that the Golan Heights has an abundance of water resources and enjoys a strategic location. “It would be difficult for Syria to counter the (American) decision without putting its house in order, enabling the return of displaced Syrians and achieving a national reconciliation,” said Abu Diab. Syria’s Foreign ministry rejected Trump’s decision. The Syrian Arab News Agency called it “a flagrant aggression on the sovereignty and territorial integrity of the Syrian Arab Republic, turning a blind eye to all international resolutions that condemned such action. The US president has no right or capacity to legalise the occupation or usurp others’ land by force... and this US hostile policy exposes the region and the world to imminent dangers,” the official said. 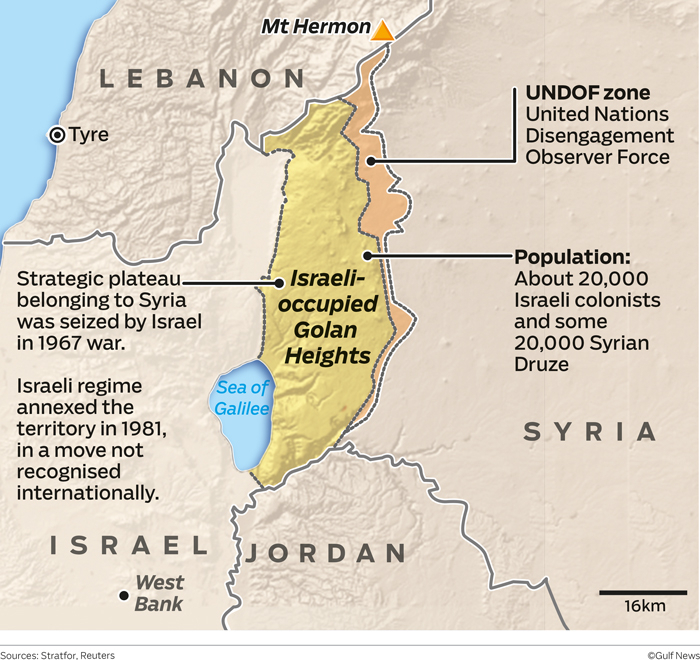 According to international law, the Golan Heights is occupied Syrian land, despite the American decision. However, analysts said it “would be naive” to count on the statements of condemnations as that will not alter the ground reality. The analysts cited the US decision on occupied East Jerusalem last May as an example. Initially, the world was outraged at the decision but subsequently, a few countries, with limited influence on the international arena, followed in Washington’s footsteps and relocated their embassies to the eastern part of the city, which the Palestinians see as the capital of their future state. Analysts also gave the example of the Iranian nuclear deal, which President Trump said his country is withdrawing from. The Europeans, despite their support for the deal, couldn’t save it and couldn’t make the American leadership change its position. US decisions are “putting international law in jeopardy and international peace at risk”. They have given rise to a situation wherein any powerful state can take territories from the “weak”, analysts said. “It was a gift for the Netanyahu [government] on the eve of the Israeli general elections on April 9,” said Juma. 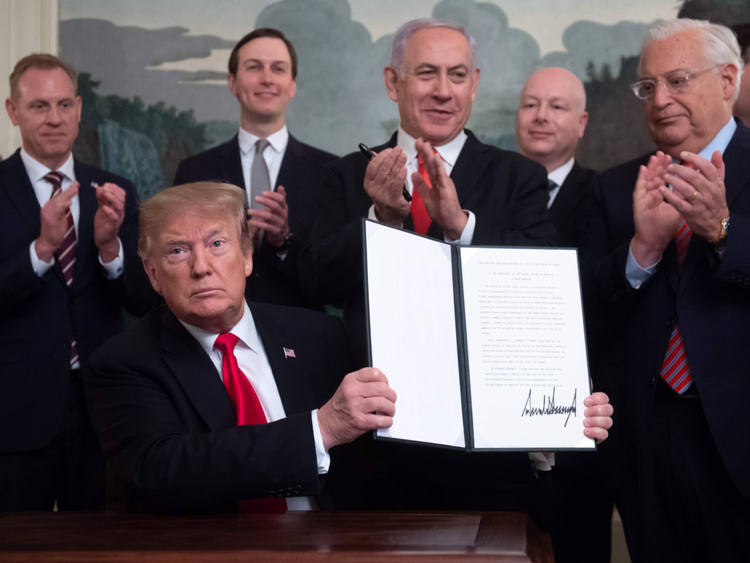 “It is a reciprocal need” for the Americans and the Israelis, said Abu Diab; Trump also needs the support of Netanyahu when the American presidential race kicks off next year. The Six Day Israeli -Arab War: On June 5, 1967, hostilities broke out between Israel and Egypt, Jordan and Syria. By the time a ceasefire called for by the UN Security Council was accepted by the parties, Israel had occupied the Egyptian Sinai, the Gaza Strip, the West Bank, including East Jerusalem and part of the Syrian Golan Heights. Termination of all claims or states of belligerency and respect for and acknowledgement of the sovereignty, territorial integrity and political independence of every State in the area and their right to live in peace within secure and recognised boundaries free from threats or acts of force. Israeli activity in Golan begins in the 1970s. 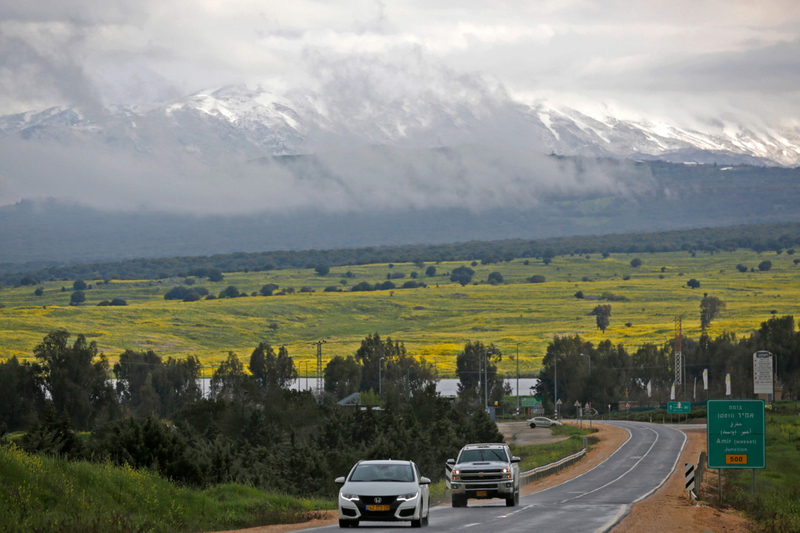 The area was governed by military administration until 1981 when Israel passed the Golan Heights Law, which extended Israeli law and administration throughout the territory. In 1981, the UN Security Council Resolution 497 adopted unanimously on December 17, declared that the Israeli Golan Heights Law, which effectively annexed the Golan Heights, was “null and void and without international legal effect” and further called on Israel to rescind its action. Israel stated that it has a right to retain the area, citing the text of UN Resolution 242 which calls for “secure and recognised boundaries free from threats or acts of force”.